One of the features found on quite a few high-end P&S cameras, and all DSLR’s (as far as I know) is the ability to output RAW files. This feature tends to be pretty confusing for new users, but power-users and pros love it. What are RAW files, and what’s all the confusion about? 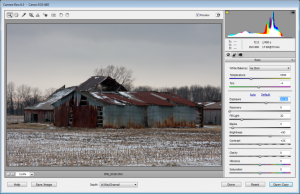 RAW files are simply unprocessed data dumps from your camera’s sensor. Despite the convention to capitalize “RAW”, these files typically *do not* have a .RAW extension — instead, each camera manufacturer has one or more formats it uses for its cameras. And yes — they’re all different, and you are quite likely to need specialized software to work with them. Since they’re unprocessed, they’re also uncompressed. This means that they’re bigger than the JPG files you’re used to shooting, so you’ll get fewer on your memory card before it fills up. What a pain, right? Why in the world would anyone ever want to use these? An example of chromatic aberration. This is one of the artifacts you will be able to correct in post processing. Image from wikipedia. White balance adjustment, based on the WB set in your camera. Saturation adjustment (more or less color). Artistic transformations (black & white, sepia, etc). Image compression. This is a “lossy” compression, which means that compression will preserve most of the information contained in your image, but some will be lost in order to reduce the image size. On most cameras, several of these settings can be combined into “presets” that choose appropriate settings for portraits, landscapes, night photos, and so on. This sort of processing is crucial to make your photos look their best; in fact, these are exactly the sort of adjustments you’re likely to do yourself if you start processing (PP) your photos with software like Photoshop or Aperture. And that’s the catch. If you let the camera do that processing, it’s really easy and it’s super fast and you don’t have to think about it, but it had better be right the first time. In most cases, you can still apply fixes of some sort to JPG files, but you’ll end up with a lower-quality image because you’re essentially undoing (and in some cases redoing) processing that was already done once to an image. On the other hand, if you start with a RAW file, you’re always starting with the information that came directly from your camera’s processor. If you process a photo and decide later to process it differently, the second version will be just as good (in terms of quality) as the first. If you upgrade to a version of Photoshop that’s better at noise reduction or dynamic range enhancement, or whatever, you’ve now got the option to go back and re-process your favorite photos to make them even better. Aperture. Although you can adjust the overall exposure of your photo in PP, you can’t change the depth-of-field that you get from your aperture setting. Shutter speed. Again, you can change exposure, but you can never fix a subject that’s blurred because the shutter was too slow. ISO. Noise introduced by a high ISO setting can be reduced in PP, but only at the cost of some detail. One final note: usually, cameras that can shoot RAW will have an option to store RAW+JPG, so you’ll get one of each file type for each picture you shoot. This might be a good option if you don’t plan to do PP work on all of your photos and you don’t mind using the extra space on your memory card. You’ll probably also see a decrease in the number and speed of high-speed bursts, too, since it takes a little longer to write both files to your memory card. If you don’t mind these drawbacks, this might help you ease into RAW shooting and post-processing. For some people, shooting in RAW just isn’t worth the hassle of additional processing and storage, but I’ve come to really appreciate the flexibility of RAW shooting. Give it a shot and see if it’s right for you.